Stellaris is a game, or at least the concept for one, that I’ve been wanting for a very long time. 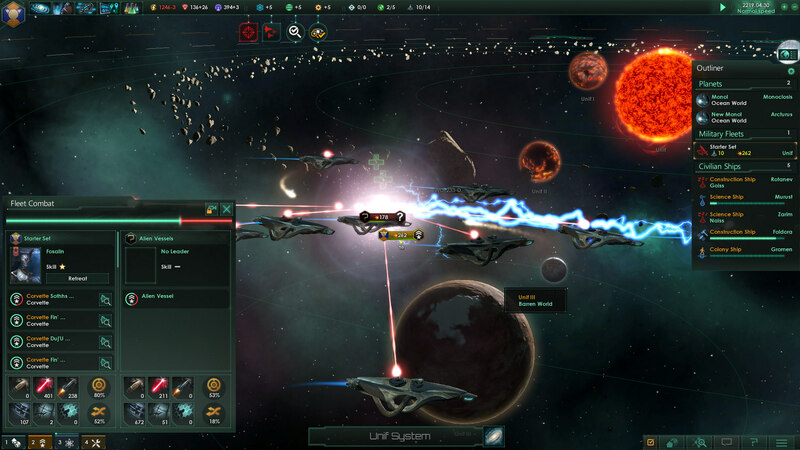 Marrying the grand strategy of Paradox Interactive and classic 4X space strategy games (read: explore, expand, exploit, exterminate) like Galactic Civilizations, Stellaris is poised to be one of the most robust games of its kind. The only question is, can this ambitious hybrid live up to the vastness of its potential? The short answer is yes. Mostly. Fleet combat doesn’t have a tactical focus, but ship design options deepen it considerably. The legacy of Paradox’s rich development history is evident right from the start. Players can create their own alien races before they even begin the game proper, assigning an assortment of different variables in addition to choosing their preferred habitat and phenotype. 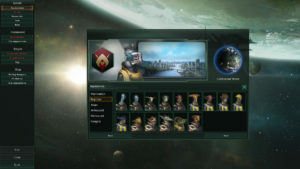 Once in the game, they’ll then find that political influence is a resource needed to recruit and maintain leadership in various aspects of their society, including the three branches of science research, stellar science exploration done via civilian ships that travel from planet to planet, the governorship of planets and sectors, and the military. War is more complex than most 4X games, requiring that both sides declare goals, meet those specific goals in their war efforts—rather than just rolling over their opponent’s entire empire—and generally deal with the end of the conflict in more diplomatic fashion than galactic genocide. Alliances with fellow empires are an option, but so are federations of four or more empires, which feature a rotating presidential seat, a position allowing one to make use of the federation fleets and declare war for the group. There is also a huge array of empire government types, migration and slavery options for different species within an empire, vassal and protectorate empires that exist under the sway of a larger group, and the ability to “uplift” and “enlighten” primitive races at various stages of early development. Even a fleet’s basic FTL travel has options. 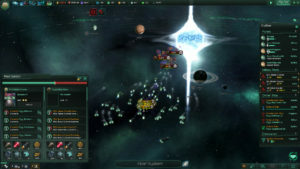 Each empire can choose one of three starting methods: warp technology sets a direct course to a star and travels to it slowly, hyperspace lanes allow for faster travel between systems but are more restrictive and can be subject to bottlenecks, and wormhole technology is even faster, allowing an empire to essentially slingshot its fleets anywhere within range of wormhole generators which need to built, and thus also defended. 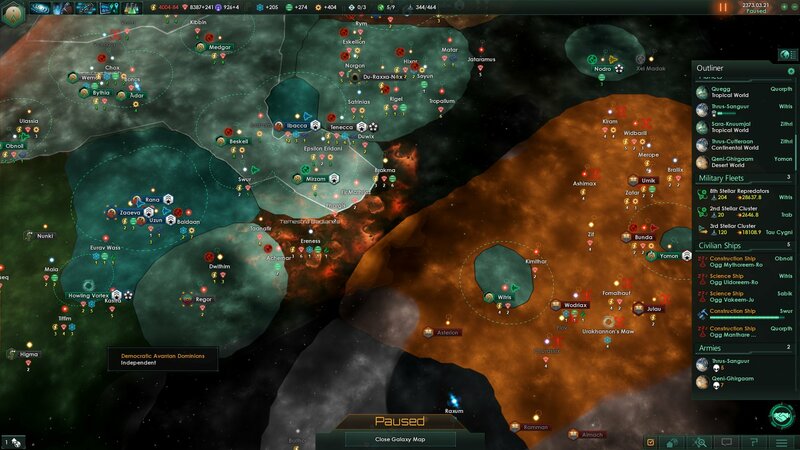 These are smart additions to the formula that go a long way toward deepening and extending the baseline 4X gameplay, making Stellaris something truly unique compared to its peers. Galaxy size and empire density can be set manually, and the possibilities are huge. Thankfully, that base offering itself is solid. The general concepts will be familiar to anyone who has played these kinds of games in the past, and they work as expected. Planets can be colonized, outposts and fortresses built, and neighboring empires negotiated with. Resources must be managed on an empire level, with energy credits (money) and minerals (materials for construction) joining the accruing influence used for political movements and sustaining empire edicts. Research happens along tech trees of the usual type, but the selection of available technologies is semi-random, reflecting that not all empires will develop in the same way. It adds a small but interesting element of surprise that makes every game fresh. Planet management falls to a Civilization-style grid, with various “pops” or population groups inhabiting different tiles that will in turn provide different benefits to economic or research production. These tiles also support a variety of structures, as do orbital spaceports which allow for further customization. To make the greatest use of these spaces, players must fight the natural obstacles of each world, which can be cleared via researching specific technologies and spending some extra time and resources. In addition, habitable planets—a statistical rarity compared to barren worlds and gas giants—come in several forms, such as continental, desert, ocean, tropical, and arctic worlds. Every species will have its own preferences, meaning that the habitability of any given planet inherently varies by race, making the rush for expansion into the cosmos all the more contentious. 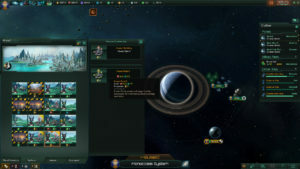 Sectors also help with planet management, allowing one to automate large sections of an empire, which then act as mini-economies that feed back to the player, at least when given enough resources to maintain their infrastructure. This cuts down on a ton of micromanagement given how much territory a player can have at any given time, though it can be slightly frustrating for those who don’t want to give up absolute control. It isn’t optional: only 5 core systems can be maintained without an economic penalty by default, and while this can be increased through research, total control just isn’t an option. That said, even though I personally micromanage city and planetary development in games like this with something approaching glee, I found that my core systems were always enough to keep me busy in Stellaris. As I expanded, bringing new worlds into the fold, I’d only turn them over to a sectorial governor after years of basic infrastructure-building, usually as I was about to make a further push for expansion with more colony ships. The system works as designed if handled correctly, but it does require the player to understand some of its nuances. Empire complexity ramps up considerably in the mid-game, making sectorial governorship a welcome reprieve. If it sounds like a lot to consider, it is. Stellaris doesn’t shy away from complexity. Yet it’s considerably more accessible than most past Paradox titles, with fairly decent tutorial options helping acclimate players to the universe. A friendly robot gives a walkthrough of some of the basics, explaining the various screens and their functions as the game progresses, and it’s a decent way to convey information gradually, without being overwhelming. It can’t answer every question or convey the nuances of every system, which players must discover for themselves, but the barrier to entry isn’t unreasonable. Some of these systems are explored in part through what can best be described as “quests” that appear in a running log. They provide objectives for players to chase after in the early game, and are generally well-written, with interesting flavor text to accompany their progression. These aren’t limited to just tutorializing, however, and various objectives open up as science vessels discover anomalies and research the myriad things hidden about the galaxy. These ongoing concerns are compelling enough that it actually becomes something of a bummer when they largely dry up in the game’s middle portions, after empires have expanded to swallow up most star systems within their ever-increasing borders, and the game does slow down considerably as those options decrease. Players will have to get creative with war and diplomacy to keep things interesting in the mid-game. And war can certainly take up a lot of one’s attention, given how differently Stellaris does things from your average 4X title. Units come in a several flavors, with civilian construction and research ships flying alongside attack vessels of various sizes and loadouts. The latter represent everything from small corvettes to hulking battleships and carriers, and a robust ship design screen allows players to fine-tune their construction. If that’s too much micromanagement, the computer can auto-update designs as new technology becomes available. The ship design tools are handled expertly, being complex enough to allow for players to meet specific needs in hull, armor, and shield values, while mixing and matching weapons and power sources via a simple system of placing components onto ship hardpoints. Low-level aggressive and neutral factions exist, bringing the galaxy to life even before other empires are discovered. This level of customization is necessary because Stellaris doesn’t feature any tactical combat. War more or less boils down to assembling fleets of different ship compositions and throwing them at each other; but this is an overly reductive way of looking at it. 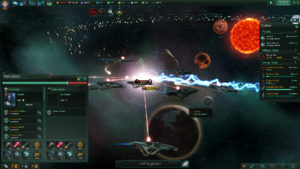 While the individual movements and attack patterns of ships can’t be micromanaged, some of their internal logic can be altered by swapping out the “combat computer” of a given design. The changes are extremely basic, but can be used with complimentary sibling ship designs to create useful dynamics within a fleet. While this means there are no micro-level tactical decisions to make during combat, modifying weapon loadouts and defensive measures adds a tactical element to warfare as players change builds to deal with new threats. In addition, the simplicity of any particular combat encounter becomes welcome as campaigns progress in length, since huge empires with multiple ongoing conflicts would have a hard time managing the details of every battle given the game’s real-time nature. Yes: eschewing the classic turn-based approach, Stellaris is a real-time strategy game, but don’t let this cause you undue alarm. The pace is slow, the game is pausable, and the speed is adjustable on the fly. There is no need for manic rushing, and given the largely fire-and-forget methodology of the combat, players will have plenty of time to attend to the needs of their empire. This feels even less like an RTS than the well-liked hybrid Sins of a Solar Empire, and shouldn’t overly frustrate turn-based gameplay purists. The overall flow lends itself to a real-time nature, also allowing for the varying FTL methods that empires can choose, and a real-time clock keeps the longer mid-game stretches of production from devolving into clicking the “end turn” button over and over again. The game is technically even pausable in multiplayer games, but only by the host, which is handy if everyone needs to stretch and grab a snack. Planet management is straightforward, but must be managed carefully to best maintain your empire. These multiplayer options aren’t neglected, either, with online matches supporting up to 32 players. Good luck finding that many friends, of course, but it’s nice to have the option for huge community-driven games if those opportunities presents themselves. You can also throw AI empires into the mix, or set yourself as an observer and watch AI empires duke it out over the course of centuries all by themselves. Unfortunately, not everything is quite so rosy. There are problems with the current state of the game, most notably a selection of bugs that affect wars undertaken alongside AI alliance partners, empires generally being a bit too passive about declaring war on players (or helping out allies in wars they might have a vested interest in seeing won), and a few other bugs associated with endgame events that keep them from working as intended. This last is truly unfortunate, as the galaxy-wide crises that develop as campaigns go toward the final stretches are an incredible addition to the standard formula. 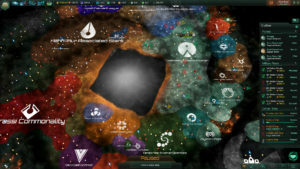 Instead of getting so huge and powerful that you can simply steamroll the universe, a number of late-game disasters can occur which are capable of affecting multiple empires or even the entire galaxy, sometimes forcing unlikely alliances. Combined with the overly-passive AI, however, it doesn’t always quite work as effectively as it could, leaving the responsibility largely with the player, which is a problem if they can’t get to the affected areas of space quickly enough to deal with the issues at hand. One of the events is also bugged to the point where players can’t successfully rid themselves of the problem, which can in some cases render a savegame nearly unplayable. The specifics of these events are too much fun to spoil in a review, but suffice it to say that if the issues can be patched, these events represent a wealth of harrowing excitement to shake up what in other titles can sometimes be a dull slog toward the finish line. It’s easy to design a custom empire to fit almost any taste, and the art designs are wonderful. 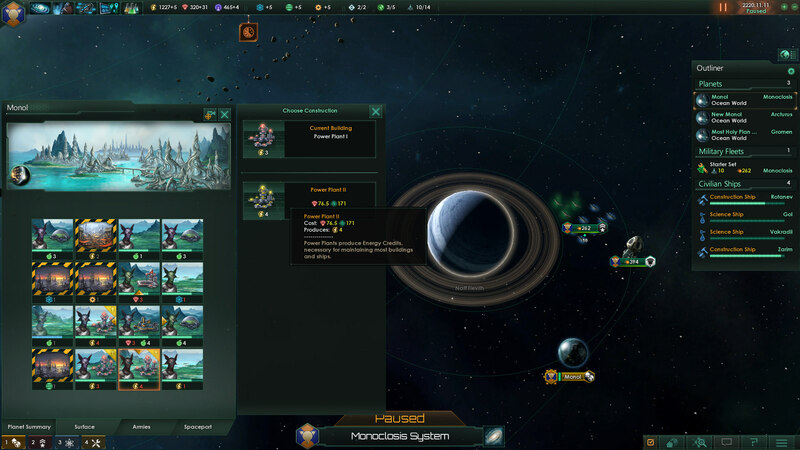 Stellaris is a lovingly crafted product that, imperfections aside, captures many aspects of what makes so-called “grand strategy” so grand, and presents them in a more accessible package with a ton of personality. It looks the part, with decent ship designs, a nice-looking galaxy filled with beautiful stars and planets, and a huge number of alien species with tons of unique portrait art to go with them—arthropoid, avian, reptilian, molluscoid, mammalian, fungoid, you name it. The music and sound are pleasing, and the interface is robust and functional. While there are some problems, Paradox has a history of long-term support for their games in the form of both extensive patches and (mostly) worthwhile DLC options, which means that the existing wealth of content is hopefully only the beginning. 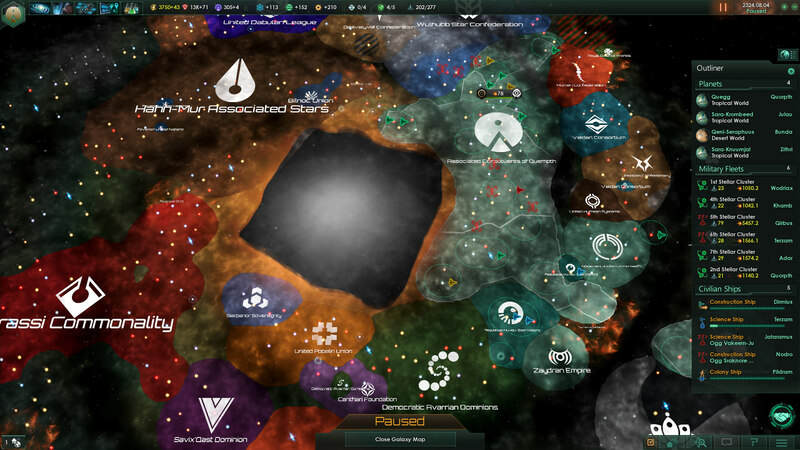 There are some bugs to fix and some areas which need fleshing out, diplomacy in particular, but even as it stands, Stellaris is an accomplished game that no fan of strategy or space exploration should miss.